I am installing new panel rad's on an excising system and have done a Slant fin heat loss for each room. Do I select a rad closest to but not below the BTU or over size a bit? Rad's will be fitted with TRV's and boiler is a conventional non condensing cast iron. I have a notion to oversize slightly and let the TRV control??? 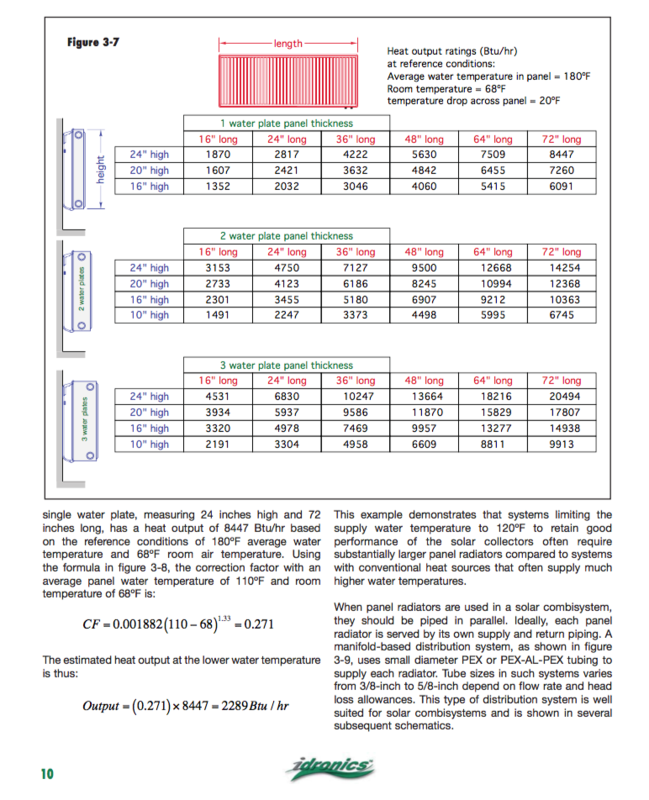 You need to know heat loss and anticipated water supply temps at design day... if your running ODR. Remember, most published btu outputs are at 180-190 supply with a 20* differential. If you plan on running them at 160* supply, then you have to oversize them. Most manufactures include a conversion table to adjust the btu output of the radiators if you choose to run them at lower temps. For example, in my living room the heat loss is ~6k BTUs/hr on design day. I choose to size radiators for 140-150*. I ended up selecting a rad with an output close to 11-12k (@180*) to meet 6k at 140-150*. Always size your rads for lower water temps. All though no mention of the rest of the system dynamics. Boiler type, and the existing radiation. Does no,good to over size some newer radiation when existing is not oversized, and there fore bound to higher water temps than the newer radiation would need. A heat loss needs to be done room by room along with an existing radiation survey. Then size the new ones to the hopefully same ratio as,the existing ones are over sized. Then the whole system can benefit from the same lower water temps. The boiler is a non condensing cast Iron Weil Mclain. This is the start of changing majority of the rad's because of changes in room sizes and renovations. Some rooms have no rad's at all and some undersized and some over. Fintube will provide for the 2nd floor bedrooms and panel rad's on the 1st floor living area. I just need a starting point on sizing so I can follow suit with the rest of the changes. I already have done a heat loss, room by room. Along with future changes with boiler piping. I just need a starting point and size future changes at the same ratio to have a balance system. Am I on the right thought pattern?? Yes. Is there a future for a new boiler in your plans? If so keep in mind that if it will be a high efficiency modulating condensing boiler you need to size emitters to get below 130 return temp to the boiler to gain close to advertised efficiency. So if you size to 150 swt at a design day you will condense all the time. Gordy, I have wrestled with the thought of a new boiler for a long time, but my 80% WM has life still and I felt the change in rad's were first. Point taken tho, plan on a boiler change out down the road. The starting point is to figure out what AWT you are going to use and select your emitters based on that. I would avoid mixing fin/tube and radiators because their low temp performance differs so much. If architectural needs dictate a baseboard-like profile, look at the lower profile panel designs (e.g. Myson Contractor Series and Runtal) or a very low temp baseboard like Smith's. Even a 160°F design AWT will still allow a mod/con to condense during most of the heating season. 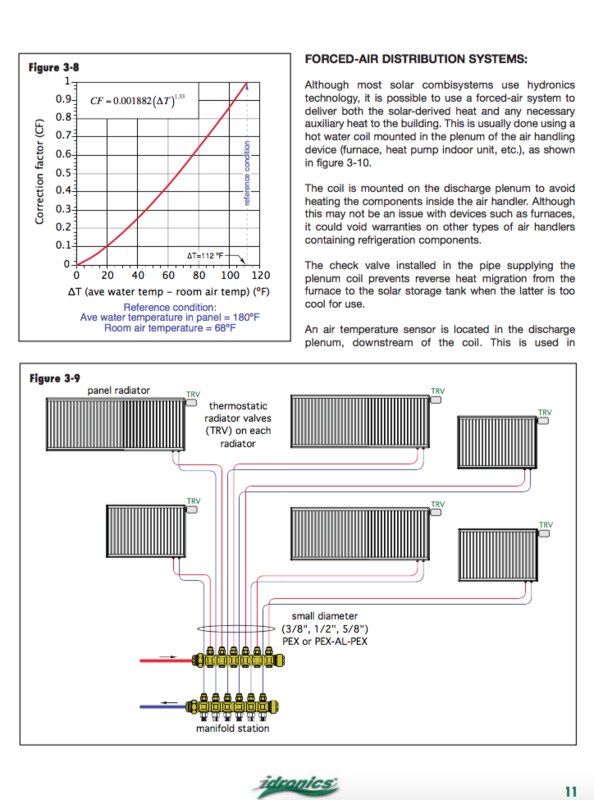 Here is a quick derate formula and example of typical panel rad outputs.